With almost 70% of its terrain covered by mountains, Japan owns a vast and rich playground for climbers and hikers. Rising up to 3776 m, Mount Fuji ―the country’s most famous and revered peak― is the highest mountain one can climb. In this context, venturing outside Japan to challenge some of the most iconic European peaks appears as an opportunity for Japanese climbers to conquer higher altitudes and take their mountaineering experience to the next level. That’s the case of Akihisa, Kazuya and Junsuke, who made it to three of Europe’s most desired summits during 2017: Mount Elbrus (5642 m), Mont Blanc (4810 m) and Matterhorn (4478 m) respectively. These climbers don’t know each other, but they all have something in common: they contacted Explore-Share and booked their trips with local certified mountain guides. Elbrus, the highest peak in Russia and Europe, is on many climber’s bucket lists. Akihisa (50 years old), works for a major advertising company in Japan and has a strong passion for outdoor sports. He is a seasoned backcountry skier, practiced windsurf for a while, and finally became attracted to mountaineering ten years ago. Besides, he practices rock climbing regularly and ice climbing during the winter season. A few years ago, he set out on a 3-year quest to climb all of Japan’s 100 famous mountains. After that, he signed up for a mountaineering training program that allowed him to summit Kilimanjaro and Matterhorn. Last year, he also attempted to climb Aconcagua. With that background, he and a partner decided that Mt Elbrus was next in line. Lying in the central Caucasus, in Russia, Elbrus is the highest peak in Europe and therefore one of the ‘Seven Summits’. Happy clients: Akihisa and his partner, together with their guide, Viktor. ©Akihisa Suzuki. Searching for a mountain guide on Google Japan, he found Explore-Share on the top results and contacted Ivan. He was quite busy but recommended Viktor, a guide from his team. “Everything went smoothly and I had no worries. Viktor seemed old but actually he was really really tough. He had been on Elbrus about 12-13 times, summited Everest twice and had climbed K2 as well”, Akihisa says. There are many routes to the top of Mt Elbrus. The normal route (South face) is the easiest and safest, while the West Side route is technically more difficult. Either way, the ascent is long and demanding, so one needs to be very well prepared. Bad weather may also be a threat on Mt Elbrus. “The trip itself was so much fun, more than I had expected. It was better to sleep in a mountain hut rather than in tents. Russian cuisine is great! We went to a spa after the climb which was fun too and the beers were cheap and delicious”, he concludes. Best time to climb Elbrus: May to October. “The timing is perfect for Japanese people to spend their Golden Week”, Akihisa says. Most climbs take between 9 and 12 days, considering acclimatization days. Keep reading: A guide to climb Mount Elbrus (including info about routes, climate, difficulty, equipment, preparation, cost). Interested? Check out all the options for climbing Elbrus with a certified mountain guide. Gouter route and Cosmique route are the most popular routes to climb Mont Blanc. Kazuya, a Japanese climber with a job at a financial brokerage firm, had dreamed about climbing Mont Blanc for a whole year. He finally set foot on the summit last July, together with Jacopo, an IFMGA-certified mountain guide. With four years of winter mountaineering experience ―he even completed some variation routes unguided―, he felt ready to face the challenge. Before Mont Blanc, he had climbed Mt Kinabalu, a 4000 m peak in Malaysia. Kazuya is also an enthusiast rock climber, able to climb indoor routes between 7a and 7a+ grades and up to 5.10d grades for outdoor routes. Apart from winter trips (mostly to the Yatsugatake range, in Japan), he also enjoys going on long mountain traverses carrying his tent during summer. 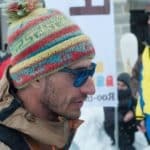 Despite his experience, he wanted to ascend Mont Blanc with a local guide because he felt more comfortable with someone familiar with the terrain and the conditions. He had heard about Explore-Share before, so he made an inquiry through the Japanese version of the site and got in touch with Elis. As the guide was busy on the dates he wanted, he introduced him to his partner, Jacopo. Kazuya booked a 2-day ascent to Mont Blanc via the Cosmiques (or 3 Monts) route, a technical and demanding route, that goes across different mountains and offers a wonderful scenery. He also included an acclimatization hike and some rock climbing prior to the ascent. He liked that he could customize the trip according to his wishes and available dates, something that’s not usually possible in fixed packages. Kazuya and Jacopo, on their way up to Mont Blanc ©Kazuya Narita. So they spent a few days at Aiguille Du Midi (France) and Aiguille Croux (Italy), getting used to altitude. He also practiced some low-intensity rock climbing. Finally, he and the guide approached Cosmiques hut. The following day, after an early breakfast at 1AM, they began the ascent to the Mont Blanc summit. Conditions weren’t the best: it was windy, very cold and there was no visibility, but Jacopo used a GPS to guide him successfully to the summit. “We almost had to turn around because of strong winds, but we summited Mont Blanc as the first ones of the day in a dense fog!”, Kazuya wrote after the trip. The guide encouraged him along the way, he was knowledgeable and friendly. Once they got back to Aiguille du Midi, Jacopo told him: “you and I are partners now”. A steep ascent on the way up to Mont Blanc’s summit. ©Kazuya Narita. Best time to climb Mont Blanc: June to September. Depending on the route, the ascent can take between 1 to 3 days. However, you should count some extra 2-4 days for acclimatization. Kazuya, for example, made it a 9-day trip. Keep reading: a guide to climb Mont blanc (including info about routes, climate, difficulty, equipment, preparation, cost). Want to go? Find a trip to reach the Mont Blanc summit in the company of a certified guide! Matterhorn, a symmetric pyramid on the Swiss/Italian border, is one of the most beautiful peaks in the Alps. For Junsuke ―a Japanese in his thirties working at a bank in Tokyo― it seemed a distant goal, until he moved to Switzerland for an MBA and realized he was at the perfect place. He had started mountaineering six years before that. Besides climbing several peaks in Japan, he used to run a lot. When the climbing season began, he contacted Guy ―an IFMGA-certified mountain guide― through the Explore-Share site and asked him about the skill level required for Matterhorn. The guide suggested that the best way to assess his abilities was doing a preparation ascent to Breithorn (4164 m) together. It was the first 4000 m climb for Junsuke and it was tough. But he was finally ready for Matterhorn. By the middle of August, they were getting ready for the ascent. The weather didn’t look good, so Guy proposed to climb a different peak. But Junsuke was so excited about Matterhorn that he decided to take the risk, even if they didn’t make it to the summit. They climbed all the way up with crampons, in heavy snow. Guy asked him regularly about his energy level: “remember that going up is fun but coming back down is mandatory”, he said. The descent was exhausting. “The moment I remember the most is not really when we made it to the summit but when we arrived back to the hut. Guy and I had lunch and after that I couldn’t stand up”, Junsuke remembers. “It was the first mountaineering trip I did with a guide. He was really relaxed and never rushed me, but when I was exhausted and needed extra energy he said “Jun, let’s go for it” and encouraged me to push a little bit more. He supported me both physically and mentally”, he says. His plans for the future include climbing Mont Blanc with a partner and Guy, and going back to Matterhorn: “during my first climb, I really didn’t have the extra energy to enjoy the views and everything. I was so concentrated! I won’t do it this year (it’s too late in the season), but now I feel like the mountains here in the Alps are a lot closer than before”. Best time to climb Matterhorn: June to September. The ascent takes 2 days. However, depending on your climbing experience and your acclimatization level, you should consider training for a few days before. Climbing Breithorn is a very good way to get prepared. Keep reading: a guide to climb the Matterhorn (including info about routes, climate, difficulty, equipment, preparation, cost). Sounds like a plan? Hire a certified guide and reach the summit of one of the most famous mountains on Earth. Traveling with a certified mountain guide is a major advantage in this kind of mountain adventure. 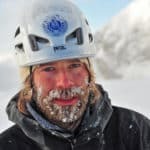 A local mountain guide provides his/her perfect knowledge of the terrain and also takes care of the logistic aspects of the trip, which may sound too complex for foreigners. 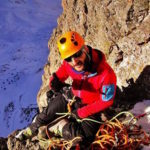 However, the main satisfaction resides in having an expert guiding you to the summit and ensuring your safety throughout the whole ascent and descent. “I believe it makes a difference to go with a trustworthy and reliable guide. I rely on reputations to reach a good guide. Even if s/he is busy, whoever s/he recommends is bound to be trustworthy too”, says Akihisa. >> English Language: is it Really an Issue? This is a common concern among Japanese climbers traveling with local European guides. Akihisa, for example, is not that fluent in English. Still, he considers his English level (average Junior high school) to be sufficient to go on trips with English-speaking guides. He even used an offline version of a translation app a few time! According to him, it may be a problem if you only understand a limited number of words. Kazuya, on the other hand, doesn’t speak much English, but that wasn’t an obstacle for him: he asked the guide to speak slowly and he was able to understand perfectly well. Climbing Mount Fuji is probably the best acclimatization training you can get in Japan. In fact, both Akihisa and Kazuya climbed it several times before their trips to Mt Elbrus and Mont Blanc. Akihisa also used a low oxygen chamber to simulate high altitude conditions. Besides, there are some places in the Japanese mountains that resemble the conditions you are likely to find in the Alps. According to Junsuke, an advanced traverse in the Japanese Alps or an ascent via the advanced route on Mt Futagoyama make excellent preparation trips in Japan. Looking forward to your next challenge in the mountains? Start small but think big: first tackle the easy/intermediate mountain ascents in your country and sharpen your technical skills for more ambitious ascents! Check out these recommended mountaineering trips in Japan. Rock Climbing in Corsica: the top 5 spots. Where to climb in Corsica?